Timmerije draws up a production development plan that contains 8 different stages. Each stage is supplied with an agreed result on which you can make a decision to proceed. For the defining the development it is important to draw up a requirements program to which your product should comply. With the knowledge and experience of Timmerije with similar plastic injection moulded products and development, Timmerije will assist you with the preparation of the complete requirements package. With the preparation of this requirements packages we assume that you will provide us with the necessary information. 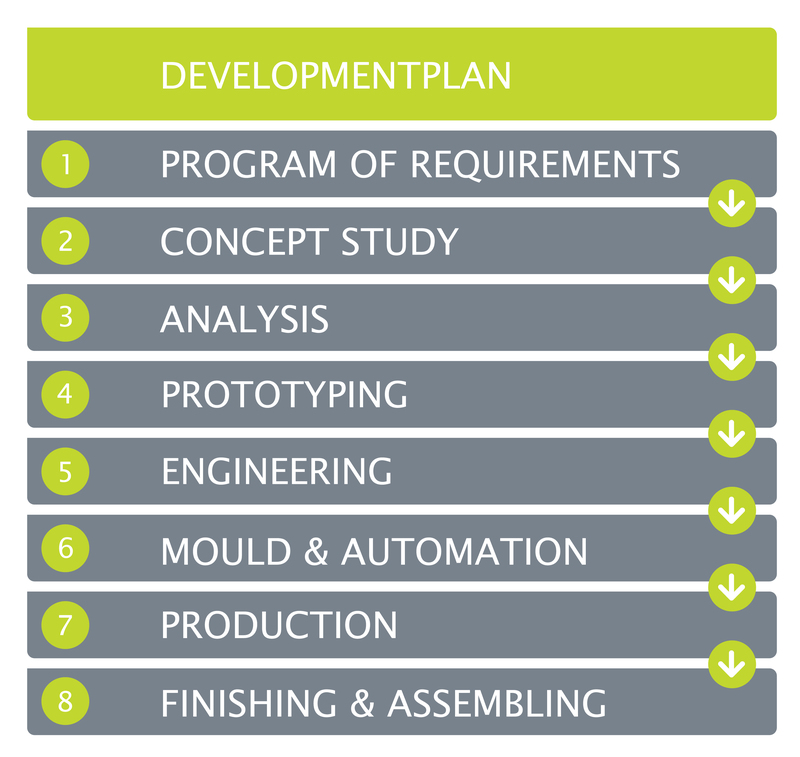 End result: a finalised requirements program. The concept concentrates on the integration of functions and the producibility as plastic injection moulded product. Delivery in this stage is one or several concepts with motivation and testing of the concepts against the requirements program and a substantiation by using design sketches. A risk assessment will take place in consultation with you. A test will be performed to establish is the choice of material is suited for the set requirements. Plus, an analysis will be conducted for the purpose of the assembly of the plastic injection moulded product. The end result is a finalised concept. To limit the risks as much as possible Timmerije will use FEMA (Potential Failure Mode and Effects Analysis). FMEA is a method to systematically investigate which possible problems could occur with the process or with the plastic injection moulded product in future. Production of one or several prototypes of the plastic injection moulded product. The model is meant for an impression of the main dimensions, fitting and details in the product. By using the latest, laser controlled techniques Timmerije is able to quickly produce prototypes without already having a mould. After all, physical, three-dimensional assessment is often necessary. For example, to check the fitting with possible other parts of your products, to assess physical proportions and such, or for other test purposes. For prototyping Timmerije has a wide range of possibilities, ranging from a simple mock-up to a full functional product. Usually an approach of “parallel actions” is selected for this where the various prototyping possibilities are used while overlapping. This will give you optimum transparency but you will retain speed within the process of test models. Elaboration of the selected concept in the design (backs, wall thickness, release, etc.) Establish releases, dimensions, tolerances, etc. 2D product drawings including dimensions to be measured for the purpose of the final production, equipped with tuning agreements to realise accurate dimensions. Based on the final 2D and 3D CAD drawings provided by you of the plastic injection moulded product to be produced Timmerije will start the development and the production of the mould. Timmerije works together with an extensive international network of mould makers for this to be ensured of the right price/quality ration and spreading of risks. The moulds are produced according the standards and specifications set by Timmerije. To realise the desired product launch for you a clear plan is drawn up. The required automation and related production tools will take place parallel to the mould production. Before Timmerije starts series production with your plastic injection moulded product, the product and the required process must to be released. Therefore, the associated documentation will be supplied according the PPAP (Production Part Approval Process) procedure. The PPAP file provides the evidence that Timmerije has understood your specific customer requirements and that it complies with this. This will be summarised for you in a Part Submission Warrant form, together with a product sample. For this extension of the production of your plastic injection moulded product similar steps are required to validate the process. Before Timmerije starts series production with the finishing and/or the assembly or your plastic injection moulded product, the product and the required process must to be released. Therefore, the associated documentation will be supplied according the PPAP (Production Part Approval Process) procedure. This will be summarised for you in a Part Submission Warrant form, together with a product sample. Timmerije will gladly provide you with more information about our Engineering and Services.